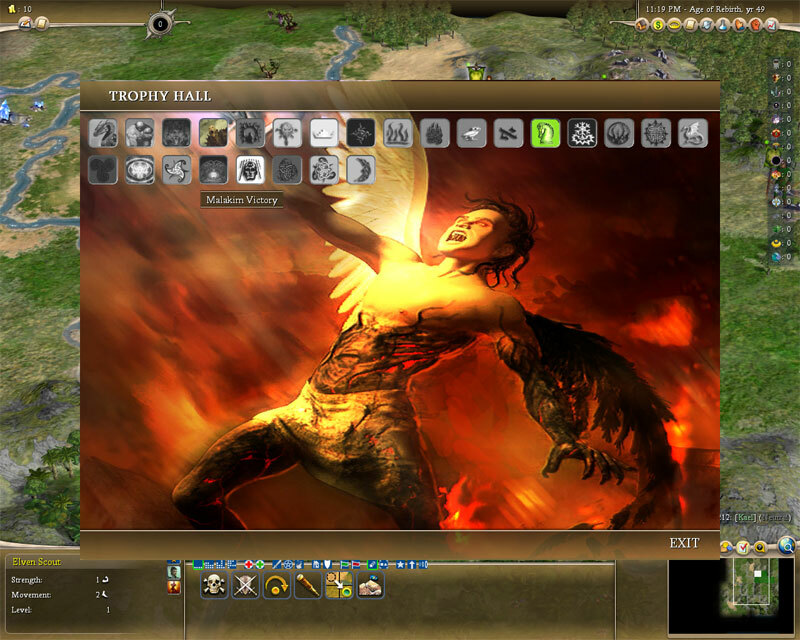 Discussion in 'Civ4 - Fall from Heaven' started by Kael, May 25, 2007. Please use this thread to post any issues you are having with FfH2 0.22. 1. Moved the cannotAttack function into the SDK (for performance). 2. Unquenching Vengeance promotion will now correctly ressurect units killed by angels or demons. 3. Removed the CvPlayer::hasBonus function (it was redundant with getNumAvailableBonuses). 4. Sacrificing a priest to found a temple wont generate a mane or angel. 5. Sacrificing a unit to add population to a city wont generate a mane or angel. 6. Using a Great Commander to join to a unit wont generate a mane or angel. 7. Sacrificing a worker to create a pirate cove wont generate a mane or angel. 8. Using a Battlemasters ability to upgrade a unit wont generate a mane or angel. 9. Spells/Summons now correctly cause war weariness (if they kill an enemy unit that qualifies). 10. Withdrawling units will still be poisoned. 11. Evangelist units will push their religion into captured cities even if there are non-combat units in the city. 12. Stoneskin can now be cast on 0 movement units. 13. Moved the onUnitMove functionality into the SDK (for performance). 14. Rewrote the giftUnit function to try to avoid giftunit errors (switched to pyplayer checks). 1. Added the Baby Spider unit (has a chance per turn of becoming a giant spider). 2. Added the Lion Pride unit (can create a lion den when on the appropriate terrain). 3. Added a Create Den ability. 4. Added the Lion Den improvement (spawns lions). 5. Added the Bear Den improvement (spawns bears). 6. Added the Wolf Pack unit (spawns wolves). 7. Added the Elephant Unit. 8. Added the Horselords trait (for hippus leaders, instead of making all the hippus horsemen have different stats they will get a promotion that boosts them). 9. Added the Horselord promotion (+1 movement and +10&#37; withdrawal) which is given to all horselord trait leaders mounted units. 10. Moved the doDamage function into the SDK. 11. Added a damage limit function to doDamage. 12. Tiles that begin the game as hell terrain will have 50 hell count assigned to them (for scenario makers). 13. Removed the resource Stone. 14. Added the Nightmare resource (hell version of horses), mounted units made with nightmares start with the Nightmare promotion. 15. Added the Nightmare promotion, +1 strength, +10% on hell terrain and the ability to learn the Fear promotion. 16. Allowed promotions to grant just attack or defense combat upgrades. 17. Added the Heroic Defense I and II promotions (increase defense strength by 1, require the hero promotion). 18. Add the Grand Menagerie wonder (requires a wolf pen, tiger cage, panther cage, gorilla cage, dancing bear and lion pen in the city, places a free carnival in every city and gives a large happiness and culture boost). 19. Added the GAMEOPTION_NO_LAIRS game option. If this is set in a scenario file lairs won't be generated. 20. Removed the Dwarven Mine improvement. 21. Removed the Guard Station building. 22. Added the Affinity mechanic. The unit gains a bonus to strength (either to base strength or to a damage type depending on the mana) equal to his affinity times the owners amount of that mana. 23. Added the BUILDING_MAX_BONUSES_NEEDED global define and set it to 3. Meaning any building only needs 3 of its bonus requirements to be built (ie: Lesser towers will only need 3 of their 4 bonus requirements to be built). 24. Added the Trophy Hall (code by Talchas). 25. Added the Repentant Angel (Mercurian only, starts with a high strength but loses a point each time he kills a living opponent). 26. Removed the Vampiric Governor specialist. 27. Removed the disciple cycle promotions (Invigorating Passion, Relentless Devotion, Unquenchable Vengeance, Purifying Ardor, Habitual Conditioning, Divine Favor and Immaculate Piety). 28. Removed the Awaken the Ancients tech. 1. Giant Spiders get defensive bonuses. 2. When a Giant Spider kills a living unit it produces a Baby Spider (it produces 2 if the owner is the Svartalfar). 3. Chance of an appropriate tile having a lizardman ruins reduced from 2% to 1.5%. 4. Chance of an appropriate tile having a barrow reduced from 1% to 0.75%. 5. Wolves have a chance of growing into Wolf Packs if they are owned by the barbarian player. 6. The following spells have a damage limit of 40% applied: Contagion, Ring of Flames, Tsunami. 7. The following spells have a damage limit of 60% applied: Crush, Maelstrom, Pillar of Flames. 8. Pyre Zombie switched to use the doDamage function. 9. Basilica cost reduced from 250 to 200. 10. Added +10% free military units population to Social Order. 11. Production bonus for the Shrine of Sirona, Temple of Temporance, Tomb of Sucellus and the Twisted Spire moved from stone to marble. 12. Arcane Golem's, Gargoyle's and Nullstone Golems dont require a resource to produce (formorly required stone or marble) but do have +25% production with marble. 13. Changed Heroic Strength I and II from +1 strength to +1 attack strength. 14. Graft Flesh now averages the targets attack and defense strength seperatly. 15. Tar Demon changed from 4/6 to 2/7 strength. When killed a tar demon is split into 2 2/3 tar demons. When a 2/3 tar demon is killed he splits into 2 2/1 tar demons. Split Tar Demons will slowly grow back to full strength. 16. Siege Workshop cost reduced from 250 to 120. 17. Succubi are now correctly marked as demons. 18. Basium is now correctly marked as an Angel. 19. Negative healing isn't possible. 20. Life mana no longer gives +2 health, instead it grants +1 health per node controled. 21. Body mana no longer gives +1 health, instead living units in their own borders heal an additonal 3% per Body mana that player controls. 22. Living units suffer a -3% heal rate per entropy mana when the lands of an opponent who has entropy mana. 23. Mines have an increased chance of finding mineral resources based on the amount of Earth nodes the player controls. 24. Spirit mana no longer gives +1 health, instead all cities get +5% Great Person rate for each Spirit mana the owning player has. 25. All cities get +3% research per turn for each Mind mana the owning player has. 26. Law mana reduces city maintenance costs by 5% for each Law mana the owning player has. 27. Chaos mana has 3% per node chance of mutating newly built living units. 28. Enchantment mana gives +1 Happy per city per mana. 29. The Guardsman promotion now counters the Marksman promotion (units with guardsman will be attacked before weaker units against marksman attackers). 30. Fire Elementals strength changed from 5 + 5 (Fire) to 5 + 3 (Fire) and given Fire Affinity: 1 (so they get 1 point of fire strength for every fire mana the owner controls). 31. Mithril Golem's strength changed from 40 to 24 and given Earth Affinity: 4 and Enchantment Affinity: 4. 32. Wraith strength changed from 5 + 5 (Death) to 5 + 3 (Death) and given Death Affinity: 1. 33. Air Elemental strength changed from 4 + 4 (Lightning) to 4 + 2 (Lightning) and given Air Affinity: 1. 34. Earth Elemental strength changed from 12 to 10 and given Earth Affinity: 1. 35. Water Elemental strength changed from 9 + 3 (Cold) to 7 + 3 (Cold) and given Water Affinity: 1. 36. Nightmare strength changed from 2 + 2 (Death) to 2 and given Death Affinity: 1. 37. Removed the +1 strength to skeletons, nightmares and wraiths from the Tower of Necromancy and it provides +1 Death mana instead. 38. Druid and Lizardman Druid strength changed from 9 to 7 and given Nature Affinity: 1. 39. Dwarven Druid strength changed from 9 to 7 and given Earth Affinity: 1. 40. Yvain strength changed from 12 to 8 and given Nature Affinity: 2. 41. Mercenaries can no longer be converted on defeat. 42. First 2 levels of the Altar of the Luonnotar (annointed and blessed) +1 GPP points removed. 43. Blessed Altar of the Luonnotar (2nd stage) +1 hammer from priests removed. 44. Final Altar of the Luonnotar (last stage) +2 hammers from priests increased to +3. 45. The Tower of Mastery doesn't require any mana resources, only that the 4 lesser towers be built. 46. Renamed the Nightmare unit to the Spectre unit. Also made it undead instead of a demon unit. 47. Hidden Nationality units no longer cause War Weariness when they are killed. 48. Removed the -1 health from Death mana. 49. Chaos Marauder Betrayal is back in. 50. The barbarian player gets to count affinity for every node of that type in the world! 51. Ars changed from 12 (+12 Death) strength to 12 (+6 Death) and Death Affinity:2. 52. Infernal Place now gives 1 of Death, Entropy and Iron instead of 3 of each. 53. The AI won't sacrifice Corlindale for peace. 54. Crusades great people modifier reduced from -100% to -50%, but you can only get Great Commanders while you are on a crusade. 55. Diseased units that win combat will only push disease onto the losing stack if they were attacking. 56. All the horsemen get +40% vs archers instead of starting with the Cover promotion. 57. Magnadine's strength reduced from 11 to 10, and given the ability to use bronze-mithril weapons. 58. Reduced the cost of Genesis from 2500 to 1250. 59. Blood of the Phoenix switched from a wonder to a ritual. 60. Added +1 trade routes to lighthouses and reduced the cost from 200 to 160. 61. Made pearls more common. 62. Cult of the Dragon is founded in the city that builds Abashi or Eurabatres first. 63. Abashi and Eurabatres start with the Cult of the Dragon and Evangelist promotions. 64. Governors Manor is now a Calabim version of the Courthouse and it provides -20% maintenance and +1 production per unhappy citizen in the city. 65. Cult of the Dragon spread rate increased from 100 to 200. 66. The AI made more likely to build adepts (aiweight increased from 0 to 300), more likely to sit on them to allow them to level up (unitai switched to city defence) and kept from spamming them (the ai will stop building them if he already has 3). 1. Added 2 new Veil songs and a new order song from Kodzi. 2. Added a mana bar to the main interface that shows how much of each mana type the player controls. 3. Moved the base alignment attitude modifiers into global defines (so players and modders can adjust them easily). 4. Put the Hero Max Free XP back into global defines. 5. Added an opening movie by Hexagonian. 6. New Monk model art by seZereth. 7. New Elohim warrior art by seZereth. 1. Fixed the Governors Manor to show up as listed in the changelog. 2. Succubi are now correctly marked as demons (no really we mean it!). 3. Goblins will upgrade to Worg Riders if they defeat wolf packs (just like they do when they defeat wolves). 4. Lion Prides and Wolf Packs can be sacrificed to create Caged Lions and Wold Pens. 5. Fixed the crash when Mobius Witches are spawned. 6. Modified the lair, and animal pack, spawn chances by game speed (slower on slower game speeds). 7. Corrected the Elohim Warriors formations. 2. Switched the Mercurians from Body to Earth starting mana. 3. Switched the Grigori from Life to Spirit starting mana. 4. Tower of Necromancy correctly provides 1 Death mana. 5. Fixed the python errors when tar demons split. 6. Correctly blocked workers and settlers when in a crusade. 7. Only fully healed Baby Spiders have a chance to become Giant Spiders. 8. Baby Spiders start at 50% health. 9. When a Baby Spider grows into a Giant Spider he starts at 50% strength. 10. Magnadines barbarian capture ability doesn't apply to animals. 11. Fixed the boom noises between turns (they were from AI players casting fireballs). 1. German translation included (thanks Kontrollator!). 2. The Dragons Hoard will now correctly spawn with Acheron, as well as getting the popup. 3. Trophies can only be awarded once. 4. Fixed Loki's run away ability. 5. Fixed the hang when creating a Pirate Cove. 1. Fixed the cult of the dragon founding when Eurabatres or Abashi come into play. 2. Fixed the issue with 0 attack strength units being unable to defend (so mud golems defend correctly now). 3. Removed the trophies a.txt requirement (possible fix for interface errors when running as non-admin users). 4. Fixed the CtD when Chaos Marauders betray. 5. Fixed Loki's run away ability. 6. Fixed the plagued messaged when Typhoid Mary attacks. 1. Angels can now correctly be upgraded to Angels of Death. 2. Baby Spiders growth chance decreased from 5% per turn to 2% per turn. 3. Wolf pen no longer gives +1 happiness and culture boost is reduced from +3 to +2. 4. Wolves only grow to packs and spawn wolves when controlled by the barbarian player or the Doviello. 5. Animals will stop spawning on a continent if there isnt enough room (1 animal per 3 unowned tiles on the continent for most animals, 1 animal per 5 unowned tiles for wolves). 6. Chaos Marauder Betrayal chance reduced from 100 to 20 (it was at 100 for testing). 7. Fixed the Graft Flesh spell sound. 1. Fixed a CtD introduced in patch "e". 1. Cold units now put out smoke/fires instead of fire units. 2. War Machine now destroy's new forests and jungles. 3. The War Machine will correctly destroy improvements. 4. Removed the vile touch check in CombatWon (I'll remove vile touch in the 0.23, it would break saves if I removed it in a patch). 5. Winning diseased units can't infect non-alive or immune to disease units in the opposing stack. 6. Fixed the Blood of the Phoenix. 7. New Spectre model art from seZereth. 1. All units that require horses will also use nightmares. 2. Fixed the war declarion on spell damage so the player casting the spell declares war. 3. Fixed a CtD when generating a great person during a crusade. 4. Non-living units can't be poisoned. - all patches are cumulative (so patch "c" has all the fixes in "a" and "b" as well as those listed). 1. I dont expect anyone to read the whole thread. But please read this post and see if your issue is addressed in apatches you don't have applied, or in a patch that hasn't been released yet. 2. Please don't report cosmetic issues here, use the cosmetic issues thread for that. 3. Please don't "chat" in this thread. I hate it when real bug reports get lost in other posts, so please try to keep this thread as on task as possible (just for bug reports) and I will try to make sure everything mentioned here gets resolved. question: is there going to be another version before Shadow ? Yup, sorry, realized what I'd done after I clicked "Post." 3. Please don't "chat" in this thread. I hate it when real bug reports get lost in other posts, so please try to keep this thread as on task as possible (just for bug reports) and I will try to make sure eveyrthing mentioned here gets resolved. 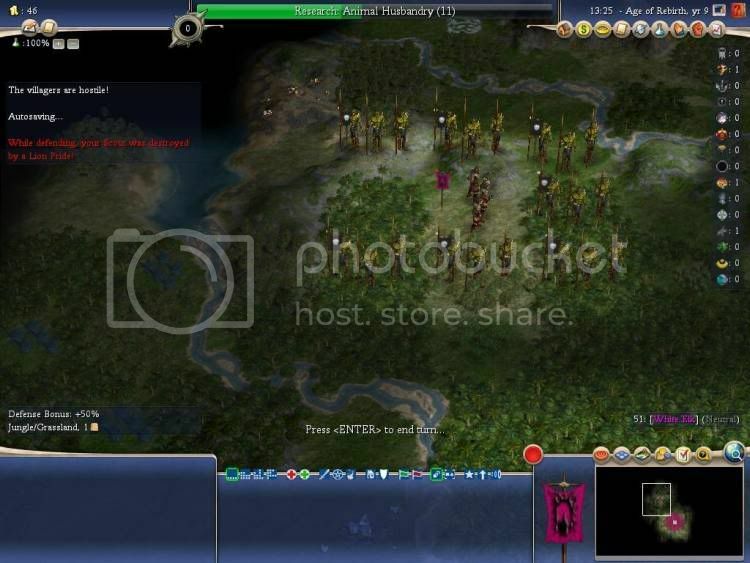 Game freeze upon exiting Civilopedia from main menu. Has not occurred from exiting Civpedia in main game. Only happened once, not repeated when returning to main menu and checking Civpedia after having played. May still be useful to know about. Loss of special initial settler upon map regeneration. Old "bug". I reported it in 0.21 and was told that. Succubi are still not demons! I would like to introduce you to Serv- Oh! Watch where you're stepping! Workers seem not to remain on task. At least, my mud golems have to be reminded each round what they are doing. Also, pathing in general not working - tell someone to go somewhere, they ask again next round. I have no buttons whatsoever... anywhere. this is the first time this has ever happened with FFH2 with me. BCalchet Human, all too human. I'll let the picture speak for itself - something has to be wrong, there. (Large Continents, Epic speed, raging barbarians off). I'm on the other continent, actually, so I'm fine. And once all is lost, when every hope is quenched and forgotten, the tide of winter will turn. In the deepest pit, fallen from the heights of arrogance, the flame that once scoured the land will light again. As the first split the heavens, the second will split the land - not with immortal soul and rage, but with blood and bones of men. I have just started a game and I was able to watch the movie It started after I choose my civ from the custom games menu. Perhaps you clicked after your selection and that bypassed the movie? Or you loaded from an old shortcut (which loads a previous version not the new one)? EDIT: I also want to report that I'm not having any problems with massive barbarians. I'm only in yr18 (quick speed) with regular barb settings. The occurance seems normal enough to me; though a village has spawned 7 Barbs. I don't recall ever having that many appear from a village in FfH. Edit2: The animal barb occurance is extreme now! "That's the key to growing and being a better person; its talking to people who are different, not to people who are the same." ~ Rusty Sachs USMC, in an interview during the Winter Soldier Investigation of 1971. Thanks for the info.I just expected the intro before the main menu appeared, so i din't try to make a game. When i created a game it appeared. Sadly I just forgot to hit export on the buildings tab in the editor. If you do that you will get it setup correctly (it will also be fixed in patch "a"). Not sure if this is a bug, playing Hippus,starting in Classical era, got an settler,archer, scout, warrior & an adept. No worker though. I assume that the old flag fix needs to be updated, or can I use it as is? Everything else seems fine so far, no problems downloading, installing, or starting a game. I tried moving my Goblin onto a wolf and received the 2 choices; do you want to declare war or No, let's reconsider. I select reconsider and my goblin attacks the wolf anyhow. How do you make worg riders and why doesn't reconsider work? As I get further in the game (yr35) the barb animal appearance is getting extreme. So I peeked with worldbuilder and there are Many Many Lions, Wolves, and Spiders. Wolves are the most prevelant by far. Also the Elephants dont attack. Is this by design?